If you are a nonprofit or social entrepreneur making positive social change in the Philadelphia area and beyond—we want to partner with you. We work with our clients to understand the current digital media landscape. We provide consulting and training in digital media platforms, social media strategies and analytics. 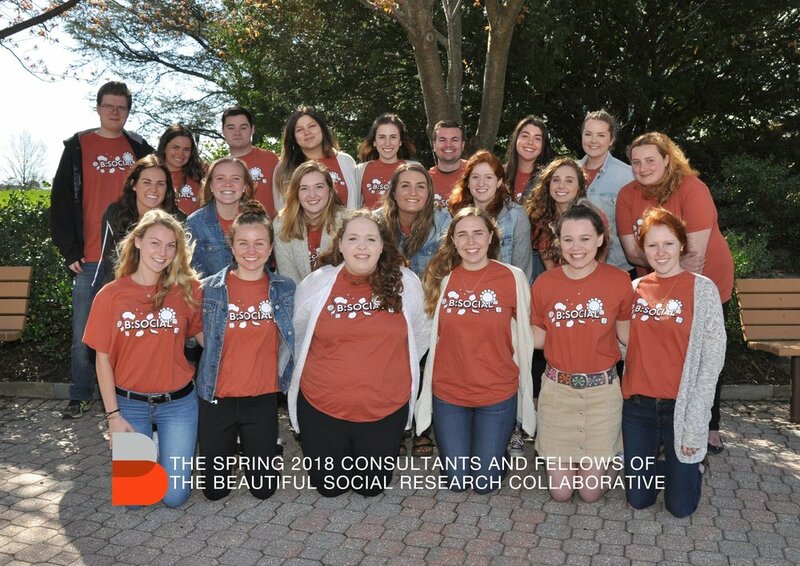 The Beautiful Social Research Collaborative consists of students and faculty in the Department of Communication Studies. Students enrolled in COM 441 Social Media and Community Engagement and COM 442 Nonprofit Communications become consultants for the enterprise while studying advanced topics in social media research and applying current theories and practices in semester-long team-based projects with community partners. The program is supported by a generous grant from the John Cardinal Foley Program for Media and Civic Engagement. Abbey is a senior Communications major with minors in English and Entertainment Marketing. On Campus, she’s involved in weekly service, Followed By A Bear, and serves as the women’s hockey team’s manager. In her free time she loves photography, music, graphic design, writing, and volunteering. Aimée is an associate professor in the Communication Studies Department at Saint Joseph’s University. She works with communities to design, implement and evaluate digital media approaches to advance transformative change. Her current book project is about how we can empower changemaking in communities by partnering digital media students with local nonprofits. Find her at @Aesthetically. Madison is a junior Communications major and Art minor. She is the Crew Captain of Saint Joe’s Love Your Melon Campus Crew and a Barista at Saint Joe’s Saxby’s café. In her free time, you can find her posting about her business, madauer beads, or pursuing her love for photography and blogging. Kelly is a junior Communications major with an English minor from Stratford, Connecticut. She is involved with the Phi Sigma Sigma Fraternity and Relay For Life on campus. In her free time, Kelly enjoys traveling, listening to music, and writing. Emma is a junior Communications major from Tinton Falls, NJ. She is involved as a crew member of the Love Your Melon crew on campus as well as being a committee member of Relay for Life. To relax and unwind, Emma loves going to the beach, spending time with her friends and scrolling through Pinterest! Bill is an Assistant Professor of Communication Studies and Digital Media at Saint Joseph's University, where he teaches classes on nonprofit communications, digital storytelling, social media, and web design. Though he teaches and studies digital media, he prefers vinyl, typewriters, and film photography. He's (very slowly) trying to learn to play the banjo. Find him @billwolffsju. communication technologies, they also participate. Students have access to cutting-edge resources as they make and reflect upon media and in the process they acquire important skills in creative design, authentic collaborative, and innovative entrepreneurship. The major prepares students for careers in digital media including web content strategy and design, social media/community management, and multimedia journalism. The Beautiful Social Award for Civic Engagement is presented to a graduating senior who has served as a Student Consultant for at least one semester but has not served as a Foley Fellow. The Student must have shown leadership as a Consultant that went beyond what is expected for Consultants and left a lasting impact on Beautiful Social. The Student must also have dedicated a significant part of their time and energy to civic engagement beyond what they complete as part of their courses and in such a way that builds lasting relationships with the individuals and communities with whom they work. Students will be nominated and voted on by faculty in the Department of Communication Studies. If no student is nominated or no student secures a majority of votes, the award will not be given.